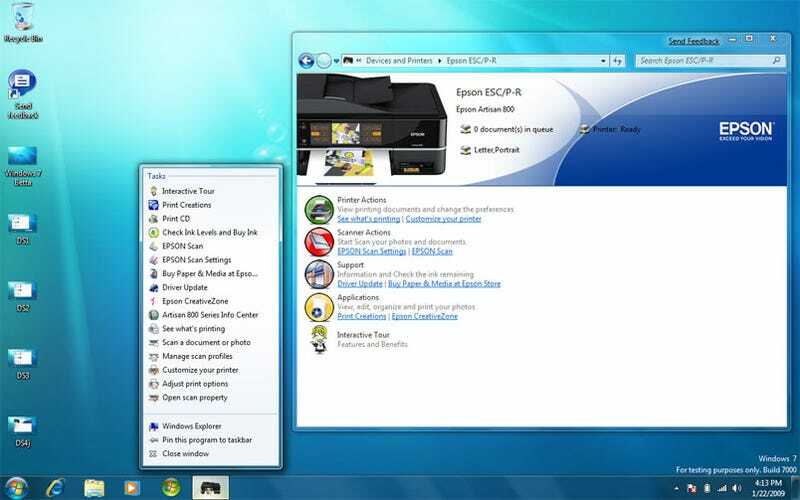 When you connect a supported gadget, like in this case the Epson Artisan 800, you instantly see the icon with its shiny black case and colorful printout. There was no download, this stuff was already cached somewhere. The icon at first had a yellow alert badge, but after a quick troubleshoot wizard, the badge changed to a happy green check mark. There are three components of Device Stage: An icon in Devices and Printers, an XML page with links to services and apps, and an icon in the taskbar with a nice tidy pop-up menu of device options. Double-clicking the icon in the Devices page brings up the services page, essentially a webpage that lives in your computer, and can launch both websites and apps. The look and feel is developed by the device manufacturer, though I'm sure there's a nice Microsoft template if needed. As you can see from both its contents and the following, cool taskbar icon, this page is the sort of thing that would probably used most when the gadget is first bought, and forgotten about later. The taskbar icon is the ooh-aah part of Device Stage. Right click it (or click and swipe upwards) and you get a series of "Tasks"—essentially a summarized version of what the big XML page offers, with some more specific commands too. Printers are pretty obvious, but it will be really fun to see what people can do with cameras and phones, not to mention totally specialized devices like a Slacker portable radio or a Chumby. Speaking of Chumby, devices don't need to connect via USB. They can connect via the network or Bluetooth, and are given the same rich metadata treatment. I did notice one thing in particular that probably won't be "fixed" in the final release: Even though the Epson menu offered all of the Artisan 800's functionality, some of the functions brought up error messages like the one you see below. I didn't run the install disc, and I am assuming that the .EXE apps that the launcher couldn't find were ones I needed to install from the Epson's CD. This makes sense: The richer the experience offered by the device manufacturer, the more likely it is that they will try to make you install more of their software. It's too bad that, as far as I know, you can't customize these jump lists, though, because I would love to see a pop up that only had the crap I care about. Don't get me wrong. This isn't a complaint about how few gadgets are currently supported by Windows 7 Beta. The list is here, and it's small, but you know damn well it's going to get longer and longer and longer, every week if not every day. What I am saying is that I have mixed feelings about what Device Stage will mean to consumer electronics companies. One one hand, companies would do well to stop messing around with their own silly proprietary crapware for say, alerting me when I need printer ink, or downloading the photos from my camera. The Device Stage interface, as you can see below, is an elegant way to facilitate those kinds of menial tasks. On the other hand, though, I hate for this to become some kind of gear mafia. Back in the day, PlaysForSure's website listed a bunch of compatible music players, but it didn't list all of them. People going to the site would have been swayed to buy officially supported hardware, even if it wasn't the best. I am sure in this case that Microsoft will upload all of the content of all those who participate, but I would hate for people to be choosing devices just because of their ability to talk to Windows 7—an inferior printer, say, having a better Win 7 interface than a superior model. UPDATE: I received the Device Stage package for the Nikon D90 (what Steve Ballmer used to demo Device Stage at CES). Here's a gallery of screenshots from that, showing similar functionality. I did have some trouble getting it to load the user's manual, but that is probably something that can be fixed before the official Win 7 launch.